Of all the photographs I shot at Fushimi Inari-taisha, and I did take a lot of photos, this one may be my favorite. 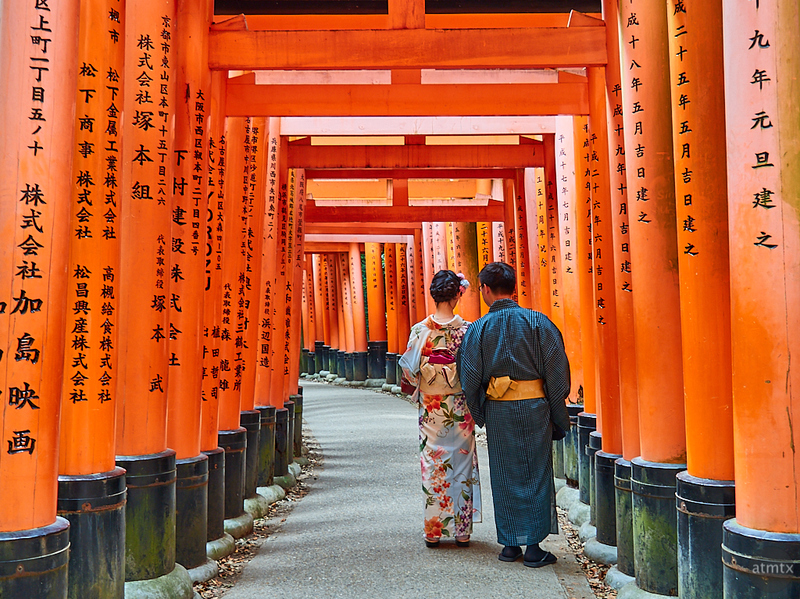 We see the multiple torii, forming a tunnel of vermillion, framing a couple in the traditional Japanese kimono. This image reminds me of the type they use in Japanese train advertisements, usually plastered big in the stations or featured in travel brochures. “Travel to Kyoto, to experience traditional Japan”, the caption may read, to promote a train and weekend getaway for the tired and overworked Japanese in Tokyo, locked away in a modern life, divorced from tradition. That’s part of the interesting dichotomy in Japan. So many of the big cities are super modern, perhaps even more so than the comparable cities in the U.S. However, not far away, there’s still a lot of tradition and nature. Kyoto is only about a 2 hour Shinkansen ride away from Tokyo. Not only is there a lot of greenery, exploring the 1000 years of history is like a time warp. Great shot. Very evocative of traditional Japan.